"My passion is to deepen relationships between animals and people... through touch"
From my early childhood, I have felt a deep connection with animals - especially horses - and choose to be a voice for all creatures who cannot speak for themselves. My father, a veterinarian, helped instill a deep knowledge and appreciation of science and math that led me to study Biology, Physiology and Animal Behavior at Rutgers University. After earning my B.A. in Biological Sciences, I returned to complete the Horse Management course, as well, through the Cook College Campus at Rutgers. When my path crossed with a particular fearful, distrustful horse (that's her in the picture), I discovered the work of Linda Tellinton-Jones and the Tellington TTouch Training Method. 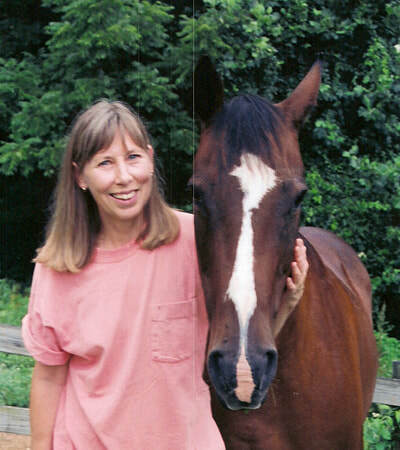 After seeing the power of touch to enhance the health and wellbeing of my own horse, as well as improve her behavior issues, I was inspired to become a TTouch practitioner for horses and companion animals. When not doing TTouch, I am delighted to be the Assistant Director of the Center for Equine Awareness in Bozeman, MT, where students come to learn how to create deeper relationships with their horses, and horses experience new connections with their humans.